Handling large order volumes is a breeze. Invoice and mark all orders as shipped with one click from the Order Overview Screen. 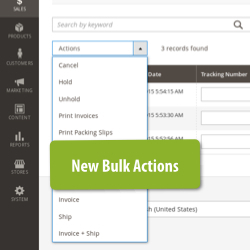 Choose to automatically generate Invoice and Shipment PDF's when you do this. Suitable for even the largest online stores – this extension saves hours of time each week by enhancing the standard Magento workflow. The smart functionality of this extension makes the Order Overview Screen deceptively simple. But it's highly configurable and packed full of all the time-saving features you need for managing Magento orders. View shipping addresses and information on the Order Overview Screen for easy reference. 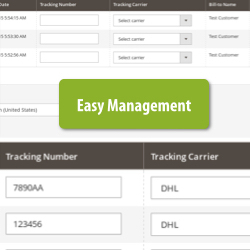 Enter tracking information straight from the Order Overview Screen (including multiple tracking numbers and multiple shipping carriers). Existing Magento 1 Order Manager customers receive an exclusive discount on upgrading to this Magento 2 extension. Email us at support@fooman.co.nz and we'll hook you up! Which new dropdown options are added?